I'm not a big fan of cleaning products and for most things use just vinegar and/or baking soda. There are a few reasons for this - I don't like tons of clutter in the house (misc. specialized cleaning bottles = clutter), don't like tons of chemicals in the house or on our hands or in our lungs, and I'm cheap. Knowing this, a friend asked me to take a look at some of the Norwex products she's fallen in love with and review them. Skeptically, I said sure. She sent me Norwex Cleaning Paste, a Window Cloth, and an Enviro Cloth. Environmentally friendly paste that cleans, polishes and protects chrome, stainless steel, aluminum, porcelain and similar surfaces in one application. Comes as a solid. Rub damp Enviro Cloth on product to create paste and apply to surface. Not for use on brass or silver. Always test on an inconspicuous surface, if you are concerned about the possibility of scratching. Use the microfiber Enviro Cloth wet (with just water) or dry to clean EVERYTHING with outstanding results. Use it dry to dust, holding the smallest particles in its fibers, creating a cleaner surface in less time without leaving a harmful chemical residue behind to collect dust. Use it wet to loosen and lift the most stubborn dirt and debris up into the cloth and away from the surface. Between laundering (with no fabric softeners or dryer sheets) simply rinse, wring out and hang to dry. No harsh chemicals. The microfiber Window Cloth allows you to clean windows, mirrors, jewelry, and shiny surfaces with only water. Simply spray water on the surface then polish with a dry Window Cloth. No harsh chemicals. I first used the Cleaning Paste and Enviro Cloth to clean my stove, which was disgusting. Seriously, yuck. This was the week I painted the cabinets white ... suddenly my white stove didn't look so white. I dampened the cloth slightly and used it to grab the tiniest amount of the paste. I have to say, I was impressed. The stove didn't come out spotless, some of the stains have been there for years, but 99% of the dirt, grease, and grime came off and came off pretty easily - I'm not going to lie, it took a fair amount of elbow grease but it got it as clean as it can get. Next to receive a cleaning treatment was the microwave. It's 11 years old and lives in a house with six kids, most of whom have dirty fingerprints. The top of it was dusty, which went unnoticed with the original light wood cabinets, but stood out like a sore thumb with the new white cabinets. Again, a tiny bit of cleaning paste and the Enviro Cloth and it came out looking great. Next stop, kitchen sink, which is stainless ... or something. It was dull and slightly discolored in the basins. With a bit of scrubbing, some paste and the cloth it came out sparkly and much cleaner. The sliding glass door and downstairs windows were next. For these I dampened the Enviro Cloth a little bit and washed the windows. They weren't particularly clean on the outside and had just been through the dust bowl of 2014 that appeared in my house when the kitchen tile was removed, so the insides were a dusty mess. After washing with the Enviro Cloth (and nothing but water!) I came behind and dried with the Window Cloth, the windows came out clean with no streaks or hazy, dusty areas. I have to say my favorite "result" to date is the windows and sliders, they come out so clean and pretty (I'd show you a picture, but they look like clean glass ... not a very exciting picture). 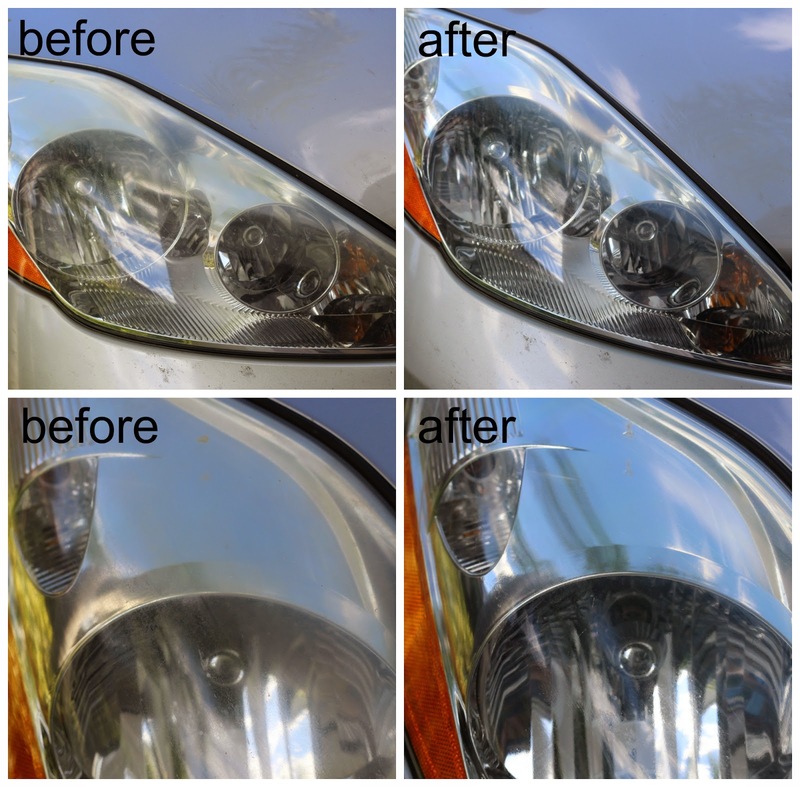 I also used it to clean my van's headlights. I tried the toothpaste trick a few months ago and it worked alright ... for a few months. It couldn't hurt to try the Norwex paste and cloth, so I did. The results speak for themselves, though I think they'd have been even more noticeable if I hadn't cleaned them so recently. 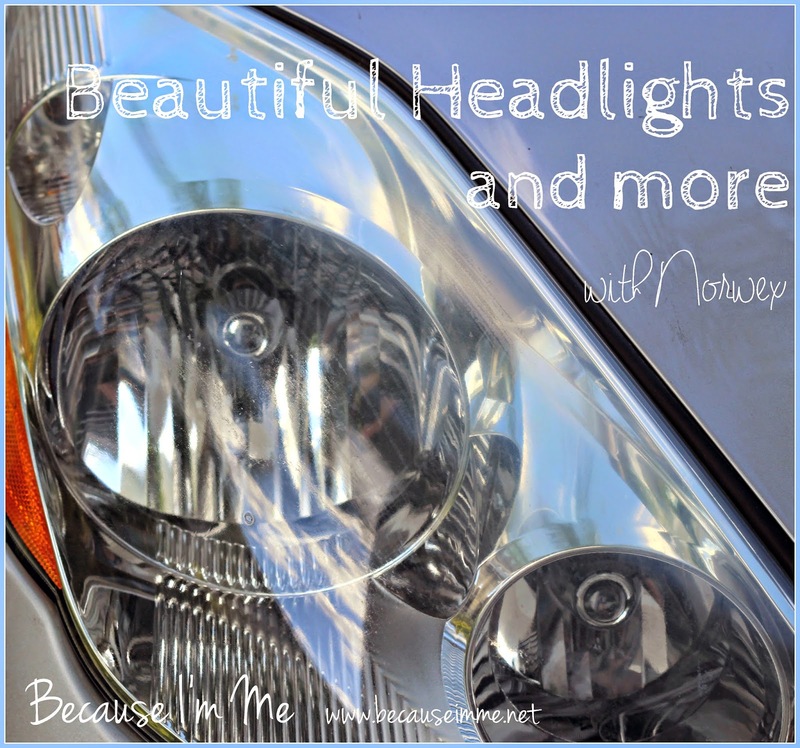 I cleaned the headlights while waiting for one of my kids to gather some stuff and get in the car - I didn't spend more than 5 minutes on the project. To give a more true comparison I didn't edit any of the photos in any way. So, three simple products to clean most of the house. Three simple products that require nothing additional but water. The initial expense of Norwex products is kind of high, but when you factor in how long they last, how easily and quickly they work, and that the only additional item needed is water they seem like a very good value. Norwex products are sold by consultants at parties, or can be purchased online here. Of course, if you want to you can become a consultant. Have you used Norwex products? What did you think?